This era of Plymouth Barracuda always seems like the Rodney Dangerfield of automobiles to many Mopar aficionados. The car seemingly just “gets no respect”. Despite being introduced about two weeks before the Ford Mustang to the same sporty compact new car market and despite having a thoroughly competitive and hot new optional 273 cubic inch, 180-hp V-8 engine with more displacement than the initial eponymous “pony car” offering out of Dearborn, the Barracuda started life as a red-headed stepchild in the marketplace and never gained the market acceptance of its crosstown rival. It wasn’t for lack of flair, given that the Mustang didn’t even offer a fastback body style until the 1965 model year. The backlight was the largest piece of glass ever engineered for any car up until that time, and was tinted in order to help prevent the solar cooking of inhabitants of the four seats. The rear seats folded down flat to allow some utilitarian use of the vehicle or even for – ahem – an impromptu sleeping quarters. Naturally enough, this was never mentioned but the advertisements of the day often showed the car stowing a surfboard in the rear. A small trunklid was also standard, as was a far more powerful (and far more reliable than Ford’s) six of 225 cubic inches and 145 hp, compared to the initial Mustang offering of 170 cubic inches and 101 hp. Nearly 45 percent more power, standard, compared to 1964 ½ Mustangs…and at a competitive price with competitive equipment. 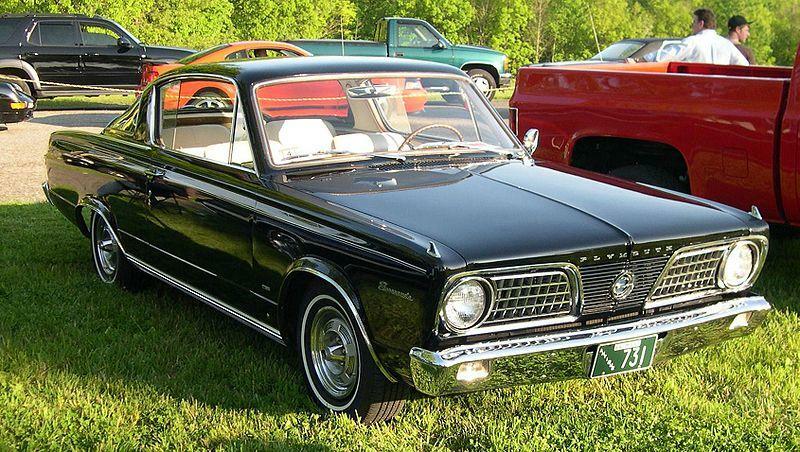 Barracuda became a specific model-line rather than a sub-series of the compact Valiant for 1965, and gained a new Formula S package, which included an uprated 273 V8 good for 235 hp, more powerful than the commonly ordered 1965 Mustang 289 V8 of 225 hp. In fact, the 1965-1966 Formula S Barracuda is regarded as a Milestone car. Another little known fact is that the Barracuda could be had with front disc brakes from 1965 on as an optional extra. These Kelsey-Hayes units were ironically also optional on period Mustangs. The problem with the Barracuda was that the vision for a specific market was correct, but marketing and design decisions hobbled it once the Mustang came out. Spending the extra money to differentiate the styling of the Mustang was the gamble that Lee Iacocca took at Ford (given that the Mustang was based upon the econobox Falcon just as the Barracuda was based upon the econobox Valiant), and Ford’s toss of the dice won fair and square. This doesn’t detract from the Barracuda, if you want something a little out of the ordinary. These cars are fun drivers and often gain more attention at car shows than do Mustangs from the same era, simply because they’re less often seen. Obviously, even GM was caught flat-footed by the Mustang, and with GM’s new 1967 market offerings in the wings, something had to be done about the Barracuda…..